As the north wind blows harder and harder, the temperature drops lower and lower. Winter in Beijing always means endless cold and dryness. To fight against the harsh winter, why not treat yourself with a soothing spa? Stepping into Tianlongyuan, clients enter a world that seems like it comes from ancient Chinese literature. The atmosphere radiates from every design detail, every brand new fixture, the clean bathrobes and the smiling staff. In the middle of the major spa area, there is a large wave- pond and a water slide. Waves are created every other hour. On both sides of the major spa area, there is a garden-like spa area with creeks, bridges, snow-white rails and steps. There is an independent hall on the second floor for clients to rest for free. It has big, soft, adjustable chairs. Clients may have the chair adjusted to a suitable angle and watch movies on a big screen while specialists massage their feet. Before entering the resting hall, clients can have professional whole-body massages in the small hall. Upon entering the spa, customers will be given a card that can be worn around the wrist. This card can be swiped for each service in the spa and no cash is necessary. Clients can pay the tally at the reception desk when they leave. There are ice performances every night at 8pm except for Monday, when the prices of lodging and tickets are 50 percent off. Price: RMB 158 per person includes a massage, medicinal spa, water sliding, performances and resting in the resting hall. A standard room overnight is priced between RMB500 and RMB600. How to get there: Take Badaling Highway, exit at 13C and head towards Changping Xiguan Isalnd. Take the Nankou exit and continue for 1km, following the road signs. 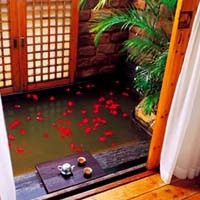 Yuquantang is an authentic Japanese spa, and has a comparatively fixed group of clients. The spa suites are all made of wood and the rooms are named after traditional Japanese symbols such as spring, pine and chrysanthemum. The suites are quiet and the bath is in the center of the bedroom. The bath is filled with 70 degree Celsius hot spring water, and fills in 20 minutes. The temperature can be adjusted. There are tea sets in the suites with bag tea. . Clients may bring their own green tea. Alternative drinks are also available. There are five outdoor ponds that comprise the public bath. Reservation needs to be made to have the pond filled. Price: A standard room is priced at RMB 230 per night and a Japanese Luxury Suite is priced at RMB 880 per night. It costs RMB 40 per person for a group of ten or more for an outdoor bath, and RMB 60 per person for a group of ten or less.